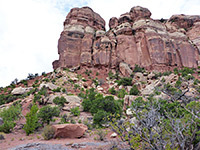 The 3.3 mile (loop) Corkscrew Trail is one of the lesser-known paths in Colorado National Monument, not starting along the popular scenic drive that follows the top of the cliffs, but instead from a residential street along the northeast edge of the preserve. 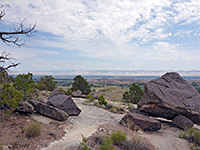 Looking west from the trailhead, the land rises dramatically, first to a flat bench above an outcrop of dark, Precambrian rock, and then by another 500 feet to the top of a reddish plateau, the south end of which forms the prominent landmark of Liberty Cap. The trail traverses open land to the base of the cliffs, climbs a short but steep ravine to the Precambrian bench, follows this southwards a way then descends even more steeply via a set of tight switchbacks that gives the path its name. The return is across open, desert-like land back to a junction near the start. 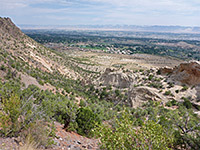 Views are good along the whole loop, of the high cliffs to the west, and all across Grand Junction and the Colorado River valley in the east, towards the distant Book Cliffs. 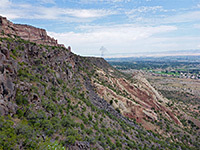 The hike starts from a small, not well signposted trailhead off Wildwood Drive, a quiet, residential street with rural surroundings along the edge of Redlands, a few miles south of Grand Junction - half a mile from the busier route of Broadway. 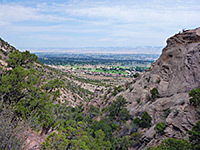 Two other, long distance paths accessed from here are the Liberty Cap Trail and the Ute Canyon Trail; both branch off the Corkscrew Trail on the bench. 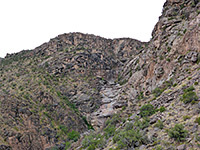 The former climbs to the top of the upper cliffs then traverses high ground while the latter follows the floor of a deep canyon, ascending steeply at the far end; both then intersect the scenic drive. There is no fee for parking. The path, signed the Liberty Cap Trail, begins due west before veering south, crossing exposed, whitish, sparsely-grassed land, rising very gently then descending into a little valley, where it divides, at the start of the loop section; right is the usual direction to continue. 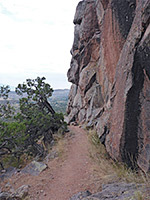 This path soon reaches the base of the greyish, Precambrian rock layer and enters a little ravine, where it ascends steeply, first to a saddle at the upper end then over boulder-strewn slopes to a reddish bench beneath sheer cliffs of Wingate sandstone - a total climb of about 500 feet. 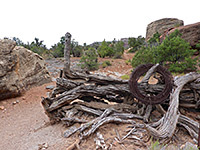 The Liberty Cap Trail departs to the west while the Corkscrew Trail goes south, along the bench, and at one point passes the remains of a corral with a roll of rusty wire. 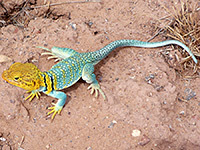 Some sections cross flat granite pavement, others are over reddish sand. 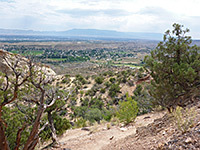 The Ute Canyon Trail forks off to the southwest, after which the path moves to the edge of the bench and starts a steep descent, briefly alongside a vertical granite cliff then down via the corkscrew set of switchbacks, to the rim of an unnamed, steeply sloping canyon, site of another wire roll, and a post. 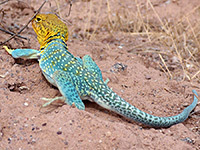 The remainder of the hike is northwest, over more gentle slopes and later sandier terrain which is crossed by several dry washes and provides an ideal home to a sizeable population of rabbits, back to the junction at the start of the loop.